Well that may be a little over dramatic but it got your attention. 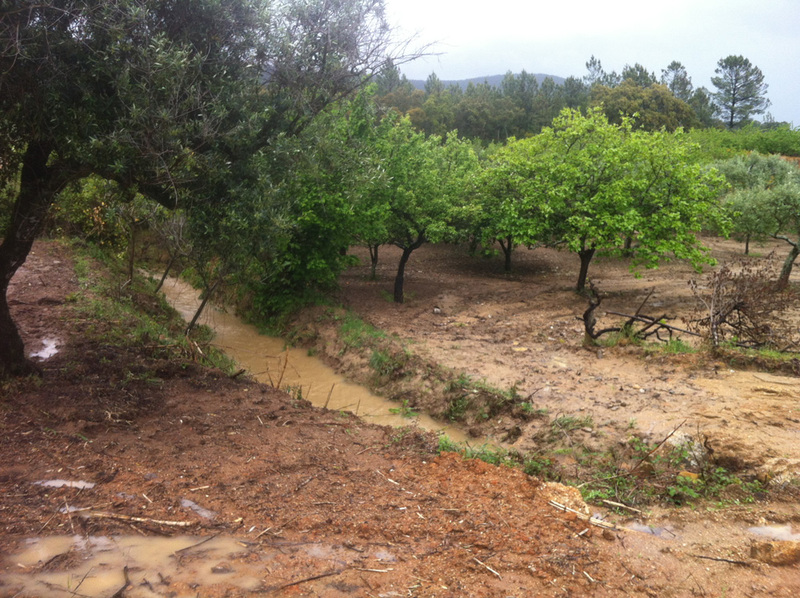 The start of May proved to be the wettest period recorded since records began for Portugal. 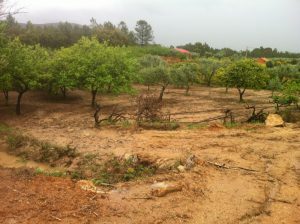 The persistent heavy rain at the start of the month put everything under pressure. We also had the additional problem that we had a lot of land clearance work completed over the last 4 – 6 weeks, clearing the land and the streams, which you would have thought would have helped with the amount of rainfall, but it caused problems because of the amount of free flowing rubbish ( off cuts from the clearing ). Had the land had time to recover we are sure most of this would have been held / helped by the vegetation. We had a bridge, well concrete pipes put in the ground to take the flow of the stream, we needed to do something to allow a tractor etc to gain access to lower section of the land. The problem was the pipes that were fitted were not really big enough to take the flow. 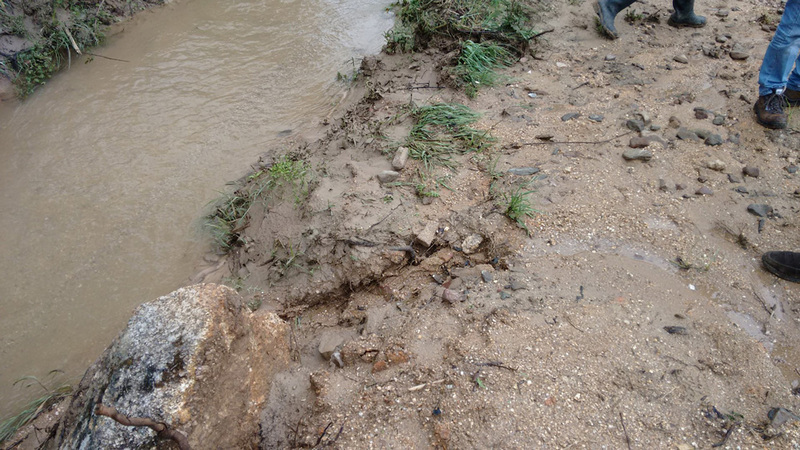 They would probably have be fine for the general average rainfall, but anything abnormal they would struggle and with the excess water this month and the rubbish coming down , blocking part of the tube caused the water to back up and overflow its banks. The net result was it washed across our land and ended up washing a fair amount of the soil and sand from our land on to our neighbour’s farm. 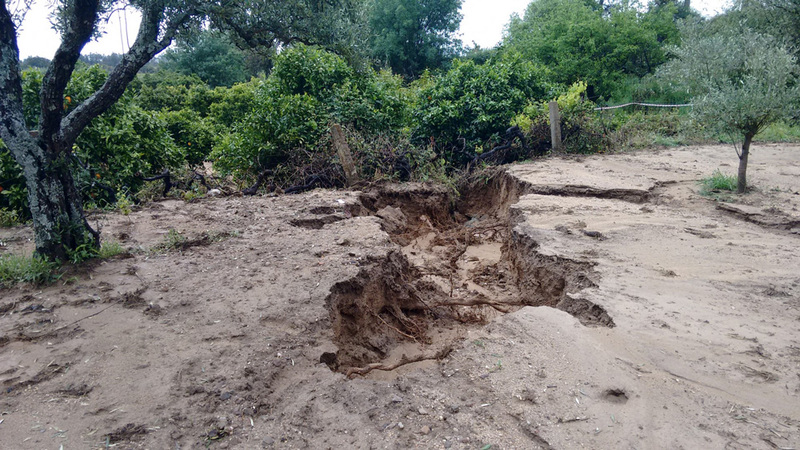 Whilst he was very understanding of the abnormal conditions, we had to agree that the work we had done had caused problems on his land, which of course we agreed to help him recover from. The men that had done the work on our land were also being very fair about the fact that they felt the under sizing of the pipe and clearing had contributed to the problem. So we agreed that we would fund the materials and they would provide the labour at their cost to correct the problem, making repairs to the land where a huge hole had appeared, repair to the bank near the neighbour and double the size of the pipe in the ground. 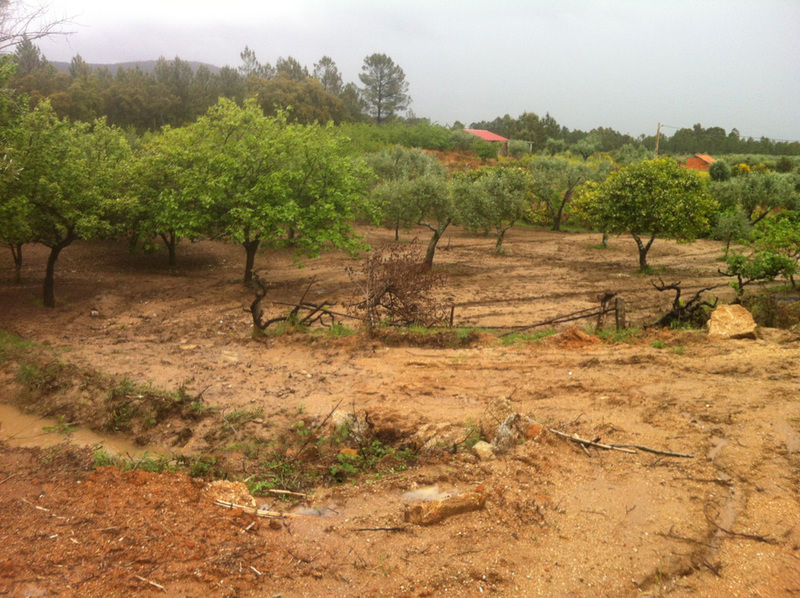 However as we approached the end of the month the work had still not been done, I guess in some ways it is understandable, that they didn’t want to progress whilst the land was still sodden after the rain and of course it is the cherry season and therefore most of the men will be out harvesting the 2016 crop, it was still however disappointing from our perspective. To make it worse, the heavy rains and now the lovely sunshine had made the grass/clover around the house go into growth overdrive! If it grows much more without having a cut they we may have a problem finding the house, lol. In any case the Swimming pool is disappearing in the long grass. We had asked the same team that was doing the work above to cut the grass as well, which they had agreed to, but……the cherries! The rain devastated the whole region and the cherry crops, production was down on the previous years by around 80%, yes thats right 80% so you can imagine what it has done to the industry and the price. Lets just hope that next year recovers. This entry was posted in 2016, Construction Update, General, Project Portugal. Bookmark the permalink.